Can’t decide between getting a poster and a comic book? Get the best of both! 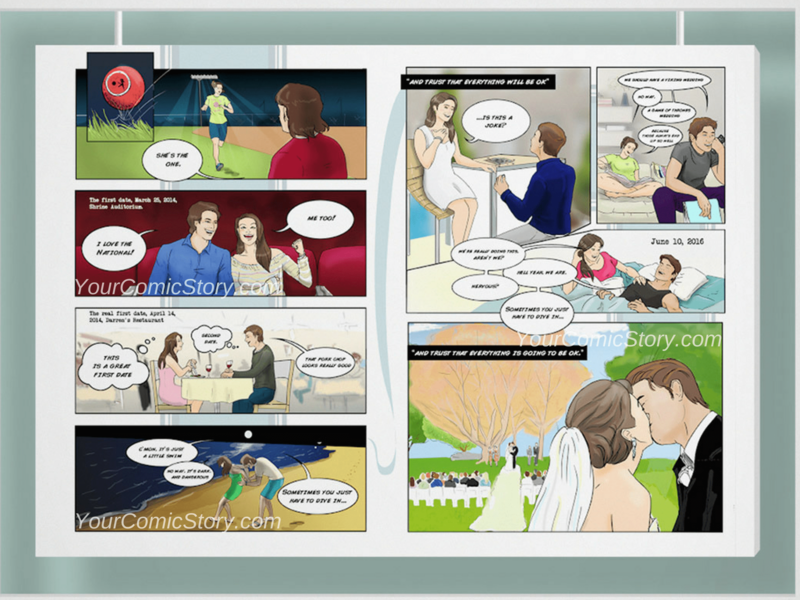 Our tailor-made comic strips put 6 – 8 comic panels of story on an 18 x 24 inch poster. You give our writers the details – photos, interesting facts about the recipient, what you’d like the gift to mean, suggestions of what you’d like to see – and our writers turn it into a wholly unique story. Perfect for birthdays, holidays, anniversaries, or just to show someone you care. A 100% unique story created for that special person in your life. The price for this one-of-a-kind gift is $250, including printing and shipping within the US, UK, Canada, Australia and Ireland (for other countries, send us a message). For more info and samples please fill out the form below or email us at info@yourcomicstory.com.